Controversial and popular from the moment it opened, The Exorcist marks its historic Blu-ray premiere in a 2-Disc Edition featuring Stunning Hi-Def Presentations of the Original 1973 Theatrical Version and the 2000 Extended Director's Cut. The frightening and realistic tale of an innocent girl inhabited by a terrifying entity, her mother's frantic resolve to save her and two priests - one doubt-ridden, the other a rock of faith - joined in battling ultimate evil always leaves viewers breathless. This greatest supernatural thriller of all time astonishes and unsettles like no other movie. As my third review of 1973’s The Exorcist, I figured I’d skimp on my movie comments. Suffice it to say that I think it remains a remarkable horror film that continues to hold up awfully well after 37 years; it truly deserves its status as a classic. 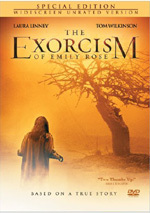 With this 2010 Blu-ray release, you get the choice of two versions of The Exorcist. It includes both the original 1973 cut as well as the 2000 “Version You’ve Never Seen”, which has been retitled “Director’s Expanded Cut”. (I guess “Version You’ve Never Seen” now sounded stupid since millions of people have seen it.) Please consult those respective reviews for my full thoughts about the two editions. I do appreciate the fact that this Blu-ray packs both versions and allows the viewer to decide. This viewer will always opt for the 1973 theatrical cut. That’s the one that’s seen as a classic, and it’s the superior rendition. The Exorcist appears in an aspect ratio of approximately 1.85:1 on this Blu-Ray Disc. For the purposes of the review, I went with the 1973 theatrical version. While it definitely showed its age, I felt very pleased with the transfer. Unfortunately, the Blu-ray lacked the movie’s original monaural soundtrack; instead, it opted for a mediocre DTS-HD MA 5.1 remix. I’m not sure of the mono audio has ever appeared on DVD; I never saw the 1997 release, but the 1998 25th Anniversary Edition provided only a 5.1 remix. As far as multichannel remixes go, I’ve heard better than Exorcist and I’ve heard worse. On the positive side, the track’s creators didn’t go nuts with the soundscape. Much of the audio remained essentially monaural, as mostly ambience spread to the side and rear channels. Exceptions did occur, as some vehicles panned across the front, and the bigger scare scenes used the back speakers to add some information, such as when the possessed Regan moved furniture around the room. The film’s spare score didn’t seem to provide actual stereo imaging, as the music simply appeared to spread mildly across the front. Given the infrequent use of score, however, this wasn't a problem. Audio quality was the weaker link here, as the stems showed their age. Speech was intelligible but tended to be reedy and thin, without a lot of naturalness on display. Effects boasted only minor thump at times and usually came across as somewhat weak. Music felt about the same, as the occasional score elements were clear enough but not especially full. At times the mix could seem a bit harsh and shrill; it wasn’t a track I wanted to crank up to a loud level. Overall, this was an acceptable remix but not one that impressed. The Blu-ray mixed extras from the theatrical and “Version You’ve Never Seen” DVDs along with some new materials. I’ll note 2010 exclusives with special blue print. We get three audio commentaries. The first two accompany the theatrical cut. One comes from director William Friedkin, as he offers a running, screen-specific look at the film. Friedkin covers how he came onto the project, working with Blatty and adapting the novel, story/character issues, makeup and effects, sets and locations, editing, cast and performances, music, audio and other elements. 10 years later, I wondered if I’d been too hard on Friedkin, so I listened to the commentary again. If anything, I wasn’t hard enough on the track, as it really offers almost literally nothing other than mildly interpretive narration. We get maybe two minutes of actual filmmaking information, and even when those notes appear – such as when Friedkin discusses shooting in Iraq – the same details already appear on the old commentary. I can think of literally no logical reason to listen to this track, as it tells us virtually nothing about the movie’s creation. It’s a total waste of two-plus hours; just stick with the original commentary and skip this stinker. Some non-disc-based materials appear as well. A one-page Personal Message from William Friedkin gives us another intro to the film; like the one on Disc Two, it’s inconsequential but pleasant. We also get a hardcover book. This comes as part of the package; open up the disc’s casing and the book appears on the left half. It features a mix of components. We discover essays about the production, exorcisms, and the film’s impact as well as cast/crew biographies, trivia and photos. The book finishes a very good set on a positive note. Is The Exorcist the greatest horror film of all-time? Probably. 37 years after its initial release, the movie has lost none of its ability to scare, as it remains nearly timeless. The Blu-ray provides very good picture, mediocre audio, and a stellar set of supplements. My only criticism here comes from the absence of the film’s original monaural soundtrack; otherwise, this is a thoroughly terrific release. 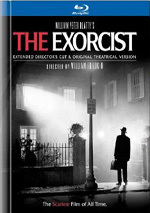 Even without the 1973 audio, I heartily recommend the Blu-ray; it’s easily the best release of The Exorcist to date.